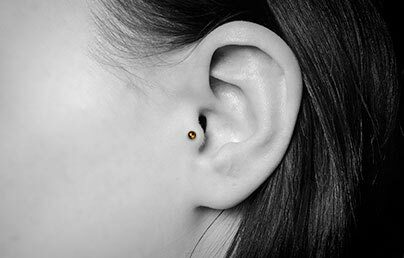 Because of the placement, the tragus piercing is perfect for anyone who wants an interesting body modification that doesn't attract too much attention, but still looks cool. The tragus piercing's unique location, and the fact that a tragus can vary in size and shape, means not every individual will be a suitable candidate for this procedure. Don't worry though, if your anatomy does not permit you to have a tragus piercing there are plenty of other cool cartilage piercings you can try! The procedure for a tragus piercing is fairly similar to other cartilage piercings with the main difference being that you will usually be asked to lie down on your back or side. 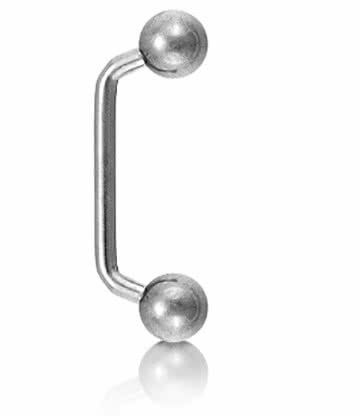 This is to allow the piercer room to manoeuvre and pass the needle through the tragus which is slightly thicker than other cartilage piercings. The piercer will first sterilize (clean) your ear and mark the intended area before beginning. Once you and your piercer are ready, a cork may be placed inside the outer ear canal to ensure the needle does not touch the inner ear as it comes through, then a straight or curved hollow needle is pushed through the tragus cartilage to create the hole. Immediately after the hole is made, the piercer will skillfully insert your chosen jewellery and secure it and the piercing is complete! The tragus is an area of cartilage which has very little blood flow or nerve endings which fortunately means that the pain experienced is usually fairly mild and does not last long. 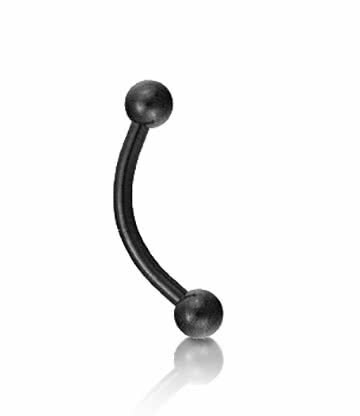 The piercing procedure itself will include some discomfort and a feeling of pressure as the hole is created as well as soreness after the jewellery is inserted and during the initial healing stages. Of course, the pain experienced from a tragus piercing, as with any piercing, will vary between individuals and a variety of other factors. 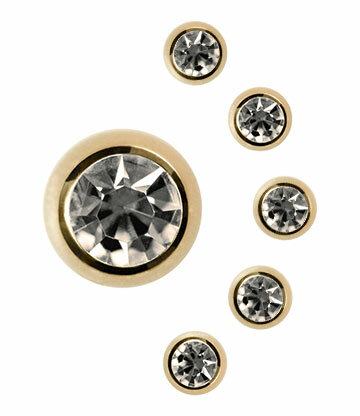 Generally, though, tragus piercings are very tolerable and over quickly. Because the tragus piercing goes through a thick piece of cartilage, the healing time is approximately 3-9 months, which is longer than other ear piercings. It is important to wait at least two months before changing your jewellery to reduce the risk of any irritation or infection. It is advisable to visit one of our professional piercers and ask them to assist you with changing your tragus piercing jewellery, as there is an increased risk of damage to the ear or infection by trying to do it yourself at home. There are plenty of jewellery options for your new tragus piercing including barbells and BCRs, so take a browse at all of our tragus piercing jewellery here!